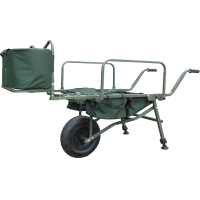 Extra large trolley for easy use: trolley made of super strong steel in powder coated moss green, one detachable extra large wheel. Additional support in front of the trolley to prevent the material from slipping + 2 additional supports on the side. 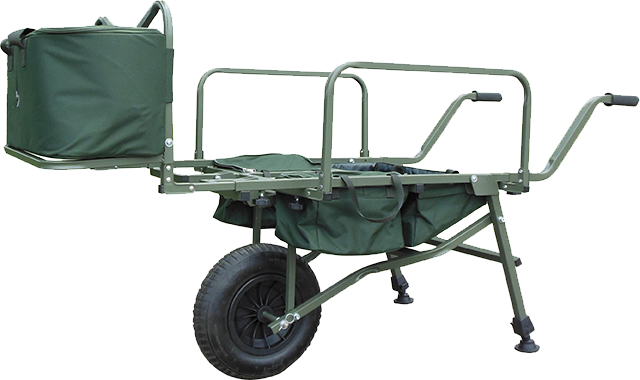 The trolley is easy to fold so that it takes little space during transport. Down the trolley is a large storage surface is provided for storing bait or other loose items. Three extra bags in front of the trolley to store all kinds of accessories.